Last week, I sort of went to San Diego. My husband traveled there by Jet Blue. I traveled there by Smartphone. My husband Skyped me from the pool. It was so romantic. He held me tight in his hand beneath a luminous sky, my face pressed against his screen. “This is the hotel,” he said, capturing the images with his iPhone, as he turned around. He Skyped me again at five o’clock. We went out for a drink in the hotel lounge. A bartender poured Jim a scotch, while I sat on the bar. It tasted rather flat, so I drank in the scenery around me instead. With drink and me in hand, Jim and I mingled in the crowd. “Do you want to meet, Frank?” he asked. He didn’t hear me over the din of conversation in the room. “This is my wife, Lauren,” Jim said to a blurred face leaning into the phone. Several other people stopped by to say hello, pushing their faces into the packed perimeter around the iPhone. Three minutes later, the connection dropped. I turned on the TV. Nothing but Republican Primary news. Just Maine caucus talk with lots of ring-wing hooey. Then, my laptop rang and Jim’s face appeared on the screen. He sat at a table with five co-workers in evening clothes. “This is my wife, Lauren,” he said to his cronies, elbow-deep in food. A fifty-something man nodded with a mouthful of meat. He did, but I only saw a blur of white. A good thing, too, since I only had a turkey sandwich. Two minutes later the connection dropped. The next morning Jim sent me an email from the tarmac. 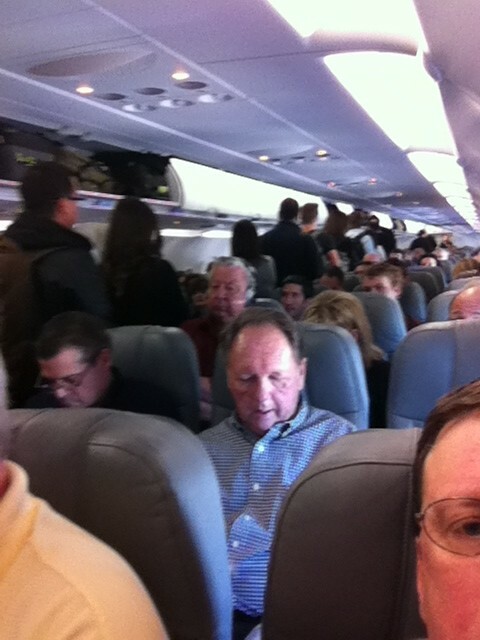 It said, “Full flight!”and included a picture from the plane. Jim's right eye beneath reading glasses. Jim watched Kitchen Nightmares on the plane. I watched Person of Interest on the couch. I landed on my buttocks at 7. Jim landed on the runway at 9. Since I lost my vacation connection to San Diego, I found out Skype memories last longer than the tan. Where did you go on your last Skype vacation? I’m sorry your vacation dropped and fell flat. Sigh. I love Person of Interest! It wasn’t much of a vacation since I didn’t benefit from any of the perks. It’s impossible to escape from the screen. I love Person of Interest, too. It’s an intriguing show. I really am unsure about Skype. I think I need to get the right angle for me so I’m looking good. My husband tries to call me on it and I won’t even answer if I’m not made up and dressed. Yeah, I’m that vain. Had I known I was going out for dinner and meeting people I would never have changed into my sweat suit. I suppose I could have just shut the laptop but that would have been rude to Jim’s co-workers. Though, most of them were drunk anyway. What a truly weird techy world we live in. The image of you “out to dinner’ with your husband in your warm up suit is so 21st century. Truly hilarious description, Lauren. Wait until they come up with the phone that tickles all of our senses. Then you will be able to smell the dinner, even if you can’t read the menu. The idea of going out for drinks and dinner with Jim via Skype was so surreal. Think of all the possibilities. People can date now without ever leaving their house. It would have been delightful to smell the ocean. Too bad there isn’t an app for that. This post was really fun to read. Thank you. I walk around looking like nobody’s business all the time. At home and in public. I WANT to be able to hide behind my phone. It’s a simple matter of privacy. There should be some kind of phone/HIPPA agency. You’re right! You never know who’s nearby lurking with a camera. I better keep an eye on Jim at home. Got to make sure he’s not going to take a photo of me in my grungy clothes (or worse) and post it on FaceBook. I know. I loved it, despite being seen wearing grunge clothes at a fancy restaurant. I’ve also been interviewed via Skype by a recruiter eating a sandwich. And I was worried about Jim walking around in his underwear. So sorry for you.. At least you had the chance to be there with him, even though it was by skype.